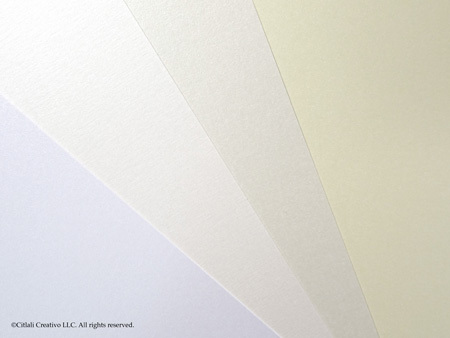 We customize each order with your Paper Color Base selected which are all part of our our house stocks. House stocks are papers we always have on hand and available for printing (shown above). The weight of each is listed below unless otherwise posted in each product listing description. All envelopes, envelope liners and paper bands (includes solid & printed and all finishes) are 70-80lb weight. 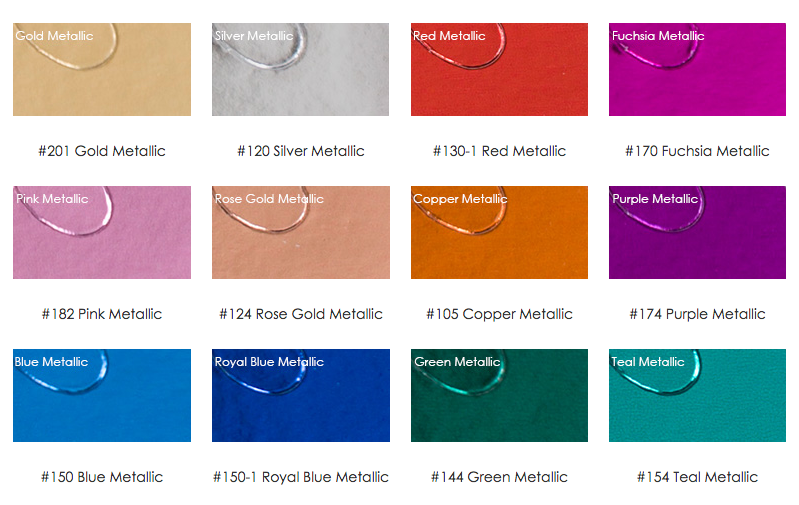 All metallic cover stocks are 105lb / 107lb weight; matte smooth & linen are 100lb - 110lb. Ink colors are endless. With digital printing, we can print almost any color (excluding metallic, white or neon) and will vary depending on equipment used to print, heat and moisture present. We will always do our best to match inks as close as possible. If matching to fabric, object and/or other item that is not ink on paper, keep in mind that they are different mediums. We we will match to the best of any printer’s ability but will not proceed if the color variation is two shades too dark and/or light. Please review our common ink colors here or view the paper swatches below to get an idea of paper and ink color pairings. 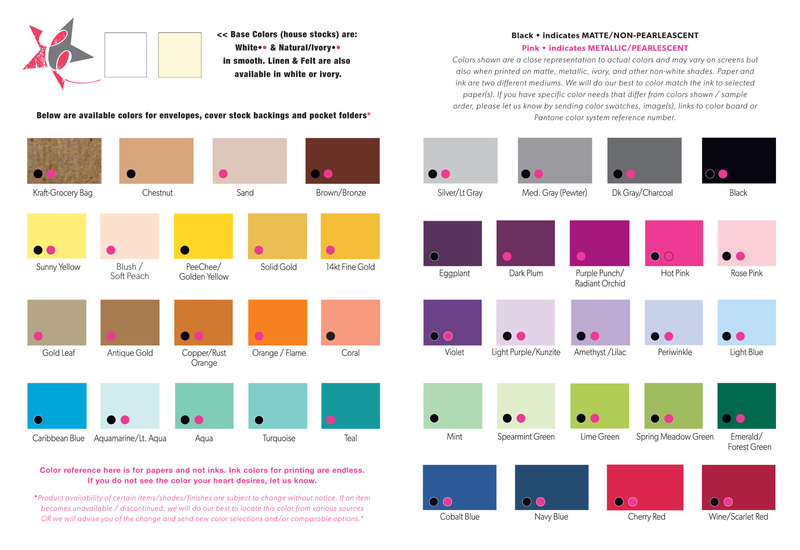 Because INK colors are endless, these swatches are only a guide to color matching envelopes, backings, pockets, accessories and ink. Although different mediums, we do our best to match the ink to paper but will not be exact. 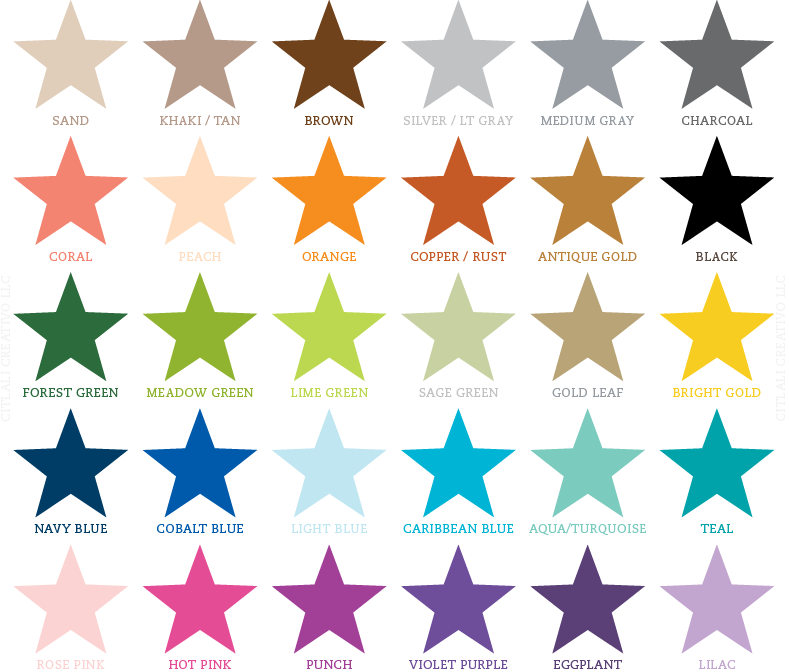 If you need a specific INK color and not paper, let us know by using the Pantone Color System Graphics colors. We will return forward the envelope/paper(s) that are closest or pairs up best. Colors differ slightly on matte & metallic finishes and on screen. Note about ink on paper: Paper mills produce paper in batches, thus producing slight variations in color/sheen. This, in specific, is also true with paper, ribbon and/or materials with a metallic and/or iridescent sheen since each take in and reflect light in different ways. If you need help with paper or envelope selection, please let us know. Other options may be available and will recommend only if they exist. We have glitter! 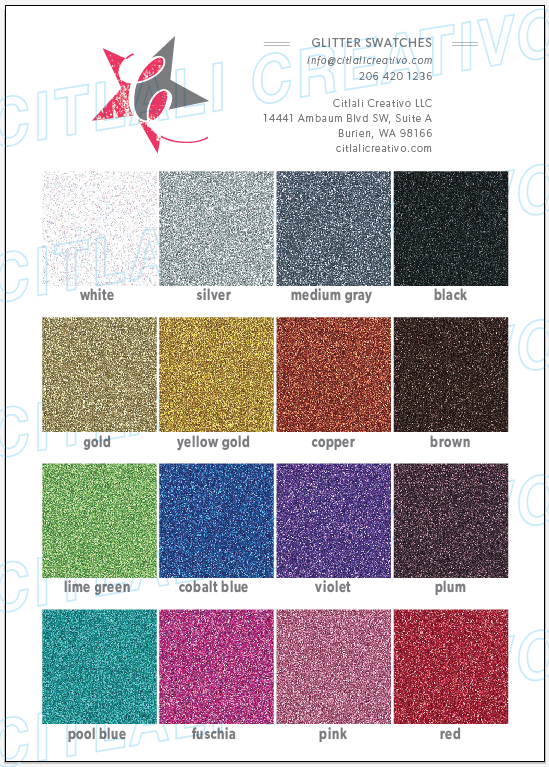 The Glitter stocks are perfect for invitations and added accessories. Great for invitation backgrounds, belly bands and envelope liners. We love foil too! The foil options can be done for most invitation designs.